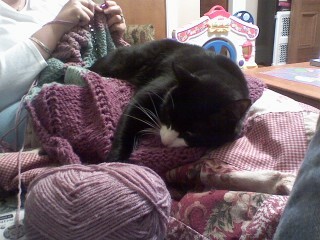 Oliver is enjoying the prayer shawl that Allison has been making. He enjoys taking some time to appreciate Allison’s work. The prayer shawl is for a special ministry at our local church. Allison has made a couple of these and each one is better than the next. Today we went to Bass Pro Shops to see Santa arrive on a bass boat. I had not been to this particular shop yet. I’ve been to a few of them in other states and each one is an experience. In this one there are two floors and so many many things to see. We went there to see Santa and we stayed for a while and had dinner. Eva had her 1st hot dog. She devoured it too. Here are some photos from the event. After that we came home and put Eva to bed. We left her with a sitter for the 1st time too. My cousin Maddie and her friend came over to make sure everything was well. We then went to the opening of my my cousin’s frame shop, The Preservation Framer. We stayed for a bit and then went for food with some of my aunts and uncles and cousins. We ended up having to take our food to go because there was 10 of us and we had only said that we would be out till 9:00pm. I wasn’t sure if my cousin would pick up the house phone if I called it or if it would wake the baby. So we took our food to go. I would have liked to have stayed a little longer with everyone because it is always fun to catch up. Also I thought we would have time to eat and go back to the frame shop. I wanted to get more opening night photos, too. I only took this one and well I was messing with the manual settings and this was the best of the bunch. You can’t do everything. Sometimes I have to remember that.